The Fukuoka City Museum has three types of exhibition rooms. The Permanent Exhibition Room, the Feature Exhibition Room and the Special Exhibition Room. 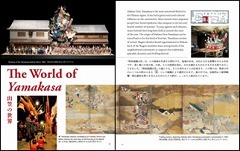 The Permanent Exhibition Room introduces the history and folk cultures of Fukuoka. Here visitors can learn the history of Fukuoka as well as the historical lifestyle of the people of this city, which has served as a gateway of foreign interchange from ancient times to the present day. The Feature Exhibition Room puts on exhibitions on the history, customs and culture of Fukuoka and/or Japan based on individual themes. The content changes about every two months. The Special Exhibition Room puts on large-scale exhibitions based on a variety of themes. The content changes about every two months. In addition to our exhibition rooms, we have other areas where visitors can explore or learn about a variety of subjects. 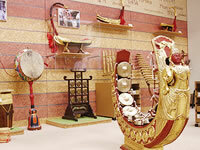 We have toys and costumes and musical instruments from Kyushu as well as from Asia. Feel free to take them in your hands. You can get a variety of information on the history and culture of Fukuoka using your personal electronic terminals, or terminals that can be rented and computers available in the museum. 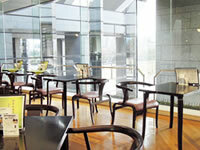 You can enjoy coffee, tea or a full meal at the Restaurant on the 2nd floor. Original goods and illustrated books are on sale at the Museum Shop on the 1st floor. There is a Nursing Room, and baby buggies can be borrowed. Eating and drinking is not allowed other than in designated areas.Eating candy, chewing gum, bringing in drinking containers without tops or stoppers are not permitted. No pets allowed.We will not attend to your pets.However, guide dogs, service dogs and hearing assistance dogs are allowed. Carrying umbrellas is not allowed.Please use the umbrella stands. Please put foldable umbrellas in your bag. No smoking is allowed in the museum.